"Great Wave" redirects here. For other uses, see Great Wave (disambiguation). The Great Wave off Kanagawa (神奈川沖浪裏, Kanagawa-oki nami ura, Under a wave off Kanagawa) "かながわ-おき なみ うら", also known as The Great Wave or simply The Wave, is a woodblock print by the Japanese ukiyo-e artist Hokusai. It was published sometime between 1829 and 1833 in the late Edo period as the first print in Hokusai's series Thirty-six Views of Mount Fuji. It is Hokusai's most famous work, and one of the most recognizable works of Japanese art in the world. The image depicts an enormous wave threatening three boats off the coast of the town of Kanagawa (the present-day city of Yokohama, Kanagawa Prefecture) while Mount Fuji rises in the background. While sometimes assumed to be a tsunami, the wave is more likely to be a large rogue wave. As in many of the prints in the series, it depicts the area around Mount Fuji under particular conditions, and the mountain itself appears in the background. Throughout the series are dramatic uses of Berlin blue pigment. Hokusai began painting when he was six years old. At age twelve, his father sent him to work at a booksellers. At sixteen, he was apprenticed as an engraver and spent three years learning the trade. At the same time he began to produce his own illustrations. At eighteen he was accepted as an apprentice to Katsukawa Shunshō, one of the foremost ukiyo-e artists of the time. In 1804 he became famous as an artist when, during a festival in Tokyo, he completed a 240m² painting of a Buddhist monk named Daruma. In 1814, he published the first of fifteen volumes of sketches entitled Manga. His Thirty-six Views of Mount Fuji, from which The Great Wave comes, was produced from c. 1830. From the sixteenth century fantastic depictions of waves crashing on rocky shores were painted on folding screens known as "rough seas screens" (ariso byōbu). [year missing][a] Hokusai drew many waves throughout his career; the genesis of the Great Wave can be traced back over thirty years. The combination of wave and mountain was inspired by an oil painting by Shiba Kōkan, an artist strongly influenced by the Western art, particularly Dutch paintings, he had seen at Nagasaki, the only port open to foreigners in this period. Kōkan's A View of Seven-League Beach was executed in middle of 1796 and exhibited publicly at the Atago shrine in Shiba. Hokusai's print Springtime at Enoshima, which he contributed to The Willow Branch poetry anthology published in 1797, is clearly derived from Kōkan's work, although the wave in Hokusai's version rises noticeably higher. In the earlier two designs the waves appear to be dense and uniform; they almost seem to be minerals. Their rigidity and verticality evoke the shape of a snow-capped mountain, while in the Great Wave the wave stands out because it is more active, dynamic, and aggressive, which makes it threatening. The earlier images are very marked by the perspective traditionally used in Japanese painting, where the viewer sees the scene from a bird's-eye view. The Great Wave, on the other hand, is depicted in a more western perspective, giving the feeling that the wave will break on top of the viewer. In the earlier prints the horizon is in the middle, whereas in the Great Wave the horizon is so low that it forces the viewer's eye to the very center of the action. In the first two, there is a sail boat on the crest of the wave, as if it had managed to escape. Hokusai eliminated this element for the Great Wave, because it interfered with the dynamic of the curve or to make the image more dramatic. The two first prints have an uneven composition, lacking consistency, whereas the Great Wave only has two important masses: the wave itself, and the vanishing point beneath the wave. 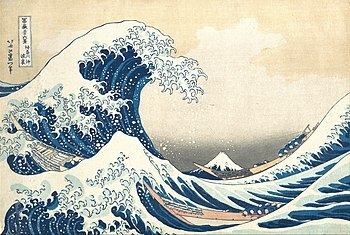 The wave shows the level of control that Hokusai had reached. The image, although simple in its design is, however, the result of a long process, a methodical reflection. The basis of this method were laid out by Hokusai in his 1812 work Quick lessons of simplified drawing, in which he explains that every object can be drawn using the relationship of the circle and square. This print is a yoko-e, that is, a landscape format produced to the ōban size, about 25 cm high by 37 cm wide. The composition comprises three main elements: the sea whipped up by a storm, three boats and a mountain. It includes the signature in the upper left-hand corner. The mountain with a snow-capped peak is Mount Fuji, which in Japan is considered sacred and a symbol of national identity, as well as a symbol of beauty. Mount Fuji is an iconic figure in many Japanese representations of famous places (meisho-e), as is the case in Hokusai's series of Thirty-six Views of Mount Fuji, which opens with the present scene. The dark color around Mount Fuji seems to indicate that the scene occurs early in the morning, with the sun rising from behind the observer, illuminating the mountain's snowy peak. While cumulonimbus storm clouds seem to be hanging in the sky between the viewer and Mount Fuji, no rain is to be seen either in the foreground scene or on Mount Fuji, which itself appears completely cloudless. In the scene there are three oshiokuri-bune(ja:押送船), fast boats that are used to transport live fish from the Izu and Bōsō peninsulas to the markets of the bay of Edo. As the name of the piece indicates the boats are in Kanagawa prefecture, with Tokyo to the north, Mt Fuji to the northwest, the bay of Sagami to the south and the bay of Tokyo to the east. The boats, oriented to the southeast, are returning to the capital. There are eight rowers per boat, clinging to their oars. There are two more passengers in the front of each boat, bringing the total number of human figures in the image to thirty. Using the boats as reference, one can approximate the size of the wave: the oshiokuri-bune were generally between 12 and 15 meters long, and noting that Hokusai stretched the vertical scale by 30%, the wave must be between 10 and 12 meters tall. The sea dominates the composition as an extending wave about to break. In the moment captured in this image, the wave forms a circle around the center of the design, framing Mount Fuji in the background. The drawing of the wave is a deification of the sea made by a painter who lived with the religious terror of the overwhelming ocean completely surrounding his country; He is impressed by the sudden fury of the ocean's leap toward the sky, by the deep blue of the inner side of the curve, by the splash of its claw-like crest as it sprays forth droplets. ... a seascape with Fuji. The waves form a frame through which we see the mountain. The gigantic wave is a yin yang of empty space beneath the mountain. The inevitable breaking that we await creates a tension in the picture. In the foreground, a small wave forming a miniature Fuji is reflected by the distant mountain, itself shrunk in perspective. The little wave is larger than the mountain. The small fishermen cling to thin fishing boats, slide on a sea-mount looking to dodge the wave. The violent Yang of nature is overcome by the yin of the confidence of these experienced fishermen. Strangely, despite a storm, the sun shines high. The Great Wave off Kanagawa has two inscriptions. The first, within a rectangular cartouche in the top-left corner is the series title: "冨嶽三十六景/神奈川冲/浪裏" Fugaku Sanjūrokkei / Kanagawa oki / nami ura, which translates as "Thirty-six Views of Mount Fuji / Offshore from Kanagawa / Beneath the wave". The second inscription, to the left, is the artist's signature: 北斎改爲一筆 Hokusai aratame Iitsu hitsu, ("From the brush of Hokusai, changing his name to Iitsu"). Over his career, Hokusai used more than 30 different names, always beginning a new cycle of works by changing it, and letting his students use the previous name. In his work Thirty-Six Views of Mount Fuji he used four distinct signatures, changing it according to the phase of the work: Hokusai aratame Iitsu hitsu, zen Hokusai Iitsu hitsu, Hokusai Iitsu hitsu and zen saki no Hokusai Iitsu hitsu. In Japanese woodblock printing the artist's final preparatory sketch (shita-e) is taken to a horishi, or block carver, who glues the thin washi paper to a block of wood, usually cherry, and then carefully carves it away to form a relief of the lines of the image. In the process, the drawing is lost. Finally, with all the necessary blocks (usually one for each color), a surishi, or printer, who places the printing paper on each block consecutively and rubs the back with a hand-tool known as a baren. There could be a great number of impressions produced, sometimes thousands, before the blocks wore out. Because of the nature of the production process, the final work was usually the result of a collaboration in which the painter generally did not participate in the production of the prints. The design uses only a small number of different color blocks. The water is rendered with three shades of blue;[b] the boats are yellow;[c] a dark grey for the sky behind Fuji and on the boat immediately below; a pale grey in the sky above Fuji and on the foreground boat; pink clouds at the top of the image. "The block for these pink clouds seems to have been slightly abraded along parts of the edge to give a subtle gradated effect (ita-bokashi)". Even though no law of intellectual property existed in Japan before the Meiji era, there was still a sense of ownership and rights with respect to the blocks from which the prints were produced. [d] Rather than belonging to the artist, the blocks were considered the property of the hanmoto (publisher) or honya (publisher/bookseller) who could do with them as he wished. In some cases the blocks were sold or transferred to other publishers, in which case they became known as kyūhan. A later impression of the Great Wave with characteristic darker sky. Given that the series was very popular when it was produced, printing continued until the woodblocks started to show significant wear. It is likely that the original woodblocks printed around 5,000 copies. Given that many impressions have been lost, in wars, earthquakes, fires and other natural disasters, few early impressions survive in which the lines of the woodblocks were still sharp at the time of printing. The remaining prints and subsequent reproductions vary considerably in quality and condition. Later impressions typically have a darker grey sky, and can be identified by a break in the line of the wave behind the boat on the right. The highest price paid for a Great Wave print in a public sale is $471,000 in March 2019. Hokusai's auction record is nearly $1.5 million as of 2012. The print owned by the British Museum cost £130,000 in 2008 and is only on display for six months every five years to prevent fading. The print is one of the most reproduced and most instantly recognized artworks in the world. Following the Meiji Restoration in 1868, Japan ended a long period of national isolation and became open to imports from the West. In turn, much Japanese art came to Europe and America and quickly gained popularity. The influence of Japanese art on Western culture became known as Japonism. Japanese woodblock prints became a source of inspiration for artists in many genres, particularly the Impressionists. Hokusai was seen as the emblematic Japanese artist and images from his prints and books influenced many different works. Vincent van Gogh, a great admirer of Hokusai, praised the quality of drawing and use of line in the Great Wave, and said it had a terrifying emotional impact. French sculptor Camille Claudel's La Vague (1897) replaces the boats in Hokusai's Great Wave with sea-nymphs. 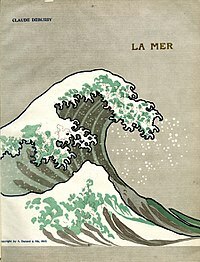 The image inspired Claude Debussy's orchestral work, La mer, and appeared on the cover of the score's first edition published by A. Durand & Fils in 1905. Indigenous Australian artist Lin Onus used the Great Wave as the basis for his 1992 painting Michael and I are just slipping down the pub for a minute. An artistic work named Uprisings by Japanese/American Artist Kozyndan is based on the print, with the foam of the wave being replaced by bunnies. Apple macOS and iOS display a small version of the Great Wave as the image for the Water Wave emoji. The logo used by the Quiksilver clothing company was inspired by the woodcut. 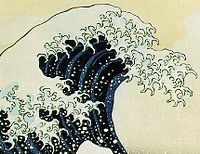 In the card game Magic: The Gathering, two cards reference The Great Wave off Kanagawa in their artwork: Rampant Growth and Kiora, The Crashing Wave. The image is featured on a limited mintage 2017 legal tender coin for the Republic of Fiji, as created by Scottsdale Mint. The image (reversed and recolorized) is featured on Kitchens of Distinction's album Strange Free World. A popular internet parody of the image, titled "Sea is for Cookie", was created for a Reddit Adobe Photoshop competition. The piece features the wave with googly eyes and cookies in the crest, resembling Cookie Monster eating cookies. La Menace suspendue, Palettes by Alain Jaubert (France, 1999). The Great Wave, The Private Life of a Masterpiece (BBC, 2004). It details the fascination surrounding the work in the East and West, its influence, and the artist's insights into a number of different areas, as revealed through the work. ^ In early prints of the Great Wave the key-block, usually only used for outlines, is simultaneously used to print the dark-blue areas of the waves. ^ The pale red seen on the sides of two of the boats in the frequently reproduced Metropolitan Museum print (JP 1847) has apparently been added by hand. ^ The concept of rights concerned with woodblock ownership was known as zōhan. ^ "Kanagawa-oki nami-ura 神奈川沖浪裏 (Under the Wave off Kanagawa)". British Museum. Archived from the original on 2014-12-11. Retrieved 2010-07-19. ^ a b c Cartwright, HE; Nakamura, H (2009). "What kind of a wave is Hokusai's Great wave off Kanagawa?". Notes and Records. 63 (2): 119–135. doi:10.1098/rsnr.2007.0039. Retrieved 7 July 2010. ^ "Katsushika Hokusai". Archived from the original on 2010-11-05. Retrieved 2010-07-07. ^ "Hokusai's Great Wave". 2010-07-07. Archived from the original on 2011-08-31. ^ "Katsushika Hokusai: The Great Wave at Kanagawa". Metropolitan Museum of Art. Archived from the original on 2010-06-14. Retrieved 2010-07-07. ^ "Under the Wave off Kanagawa (The Great Wave) by Hokusai (1760–1849)". Archived from the original on 2011-07-11. Retrieved 2010-07-10. ^ Nipponia. "El Monte Fuji como Objeto Artístico" (in Spanish). Retrieved 7 July 2010. ^ a b Radio UNAM. "La Gran Ola de Kanagawa" (in Spanish). Archived from the original on 22 July 2011. Retrieved 7 July 2010. ^ Guimet Museum. "Hokusai "Mad about his art" from Edmond de Goncourt to Norbert Lagane". Archived from the original on 14 October 2010. Retrieved 7 July 2010. ^ Bibliothèque nationale de France. "Hokusai, Les Trente-six vues du mont Fuji" (in French). Retrieved 7 July 2010. ^ a b c "Woodblock Prints in the Ukiyo-e Style". Metropolitan Museum of Art. Retrieved 2010-07-05. ^ "Ukiyo-e, arte de grabado japonés" (in Spanish). Archived from the original on 2010-04-19. Retrieved 2010-07-11. ^ "Ukiyo-e: Imágenes del mundo flotante" (in Spanish). Archived from the original on 2010-12-10. Retrieved 2010-07-11. ^ "Masterpieces from the Ota Memorial museum of Art Paintings and Japanese prints". Musée Guimet. 2005. Archived from the original on 2011-07-20. Retrieved 2010-07-05. ^ "Viewing Japanese Prints: What Is an Original Woodblock Print?". Viewing Japanese Prints. Archived from the original on 2008-03-27. Retrieved 2010-07-06. ^ a b Society, Infocobuild. BBC, ed. "Private Life of a Masterpiece: Episode 14 - Katsushika Hokusai: The Great Wave". www.infocobuild.com. ^ a b c Gamerman, Ellen (March 18, 2015). "How Hokusai's 'The Great Wave' Went Viral". The Wall Street Journal. ^ "Hokusai woodblock prints fetch high prices in NY". NHK World-Japan. 20 March 2019. ^ Sooke, Alastair. "Katsushika Hokusai: the starving artist who became the prince of tides". The Daily Telegraph. Retrieved 22 October 2018. ^ "Letter 676: To Theo van Gogh. Arles, Saturday, 8 September 1888". Van Gogh Museum. ^ Cirigliano II, Michael (July 22, 2014). "Hokusai and Debussy's Evocations of the Sea". Metropolitan Museum of Art. ^ Ashcroft, Bill (2013-07-26). "Hybridity and Transformation: The Art of Lin Onus". Postcolonial Text. 8 (1). ^ "Uprisings – Kozyndan". kozyndan.com. ^ "Water Wave Emoji". Emojipedia. Retrieved 2014-10-29. ^ (In French) L'Express (13 July 2000). "Surf La planche à billet". Retrieved 2009-09-06. ^ "2017 Fiji Great Wave Proof Silver Coin (Colorized)". Archived from the original on 2016-10-22. ^ Streams, Kimber (2014-01-24). "Sea Is for Cookie, A Mashup of Cookie Monster and 'The Great Wave off Kanagawa'". Laughing Squid. Retrieved 2018-02-27. ^ "'The Great Wave' by Hokusai". Fulmartv.co.uk. 2004-04-17. Archived from the original on 2010-07-22. Retrieved 2010-07-04. Forrer, Matthi (2003). "Western Influences in Hokusai's Art". In Calza, Gian Carlo. Hokusai. Phaidon. ISBN 978-0714844572. Guth, Christine M. E. (December 2011). "Hokusai's Great Waves in Nineteenth-Century Japanese Visual Culture". The Art Bulletin. 93 (4): 468–485. doi:10.1080/00043079.2011.10786019. Calza, Gian Carlo (2003). Hokusai. Phaidon. ISBN 978-0714844572. Wikimedia Commons has media related to The Great Wave off Kanagawa. This article is about an item held in the British Museum. The object reference is 3097579.